Foam Pad Glaze delivers dazzling gloss and removes micro-surface imperfections and oxidation. This product will remove 3000 grit sand scratches and similar imperfections. The product buffs without gumming or clogging pads. 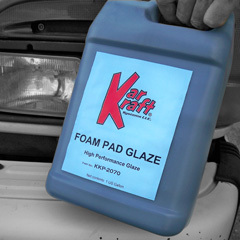 Foam Pad Glaze contains no silicone or waxes and leaves a non-oily dust free mirror-like shine.